When helping faculty with their D2L courses I see a common problem almost daily: uploading images to D2L that are full resolution and too large for the screen. 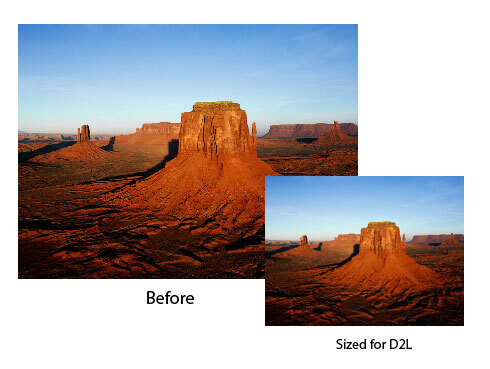 Sure, once uploaded to D2L they can be sized on screen visually, but image size itself stays the same – – so over time and with multiple unreduced images being uploaded, it will bloat the size of the course (making backups and page loading for the students very slow). What can you do if you don’t have Adobe Photoshop to size, crop and manipulate your images before uploading? I have a couple of free solutions below. http://fotoflexer.com – for quick and easy editing right online. Try it – great for a quick fix with a very intuitive interface. You don’t even have to open an account! Photos are uploaded, sized, cropped and corrected right online, then, when ready, save a copy to your drive. It’s as easy as that! http://www.gimp.org – my old time favourite if you need more. GIMP – although this needs to be downloaded, it has much of the power of Adobe Photoshop without the price tag. Do you have a favourite you’d like to add? Let us know! We’re always glad to learn about additional resources! Great post! I would also suggest Microsoft Office Picture Manager which is included with MS Office under Microsoft Office Tools. Also http://pixlr.com/ is also one my favourite go to image editors which runs in the browser. Awesome, Michael! Thanks for the additional resources!